Julia Pettinati (nee deJesus) a life time resident of Mt. 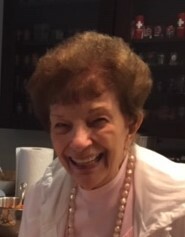 Vernon passed away peacefully on January 23,2019 at the age of 96 with all her children by her side. Julia was married to the love of her life Marty for 60 years. He predeceased her in 2009. Julia always had a strong faith which carried her through life and enabled her to always have a warm smile for everyone she met. Julia was a long time parishioner of Sacred Heart Church in Mt Vernon. She graduated from Edison in 1941, married in 1949 and raised her 4 children Donna Lakis, Janie Carpanzano (Mario), Glenn Pettinati (Sunny) and David Pettinati (Karen). She went to work at Mt Vernon Board of Education after her last child graduated high school and remained there for 20 years. Everyone who knew Julia was touched by her thoughtfulness and kindness. She was known as a gourmet cook especially for her signature fried chicken and a wonderful baker because who could forget her chocolate cream pie. She was a wicked card player at all the family gatherings and couldn’t wait to get the cards out. She was blessed with her grandchildren, Adam, Caitlyn (Mark), Nick (Katie), Victoria (Tom), Cassie and Max as well as her adopted grandchildren Rachel, Alex, Stefanie and Diana. She had 2 great grandchildren Piper and Finnley were a very special blessing in her life and she was hoping to meet two more in June and July. Julia was predeceased by her son in law Tony in 1996, son Glenn in 1998 and her grandson Trevor in 2013. Friends can share the celebration of her life at the funeral home on Sunday from 2 to 6pm. Mass of Christian Burial will be held on Monday at St. Augustine’s Church in Ossining at 10am. Burial to follow at Rose Hill Memorial Park. In lieu of flowers, donations can be made in her name to her favorite charity www.Stjude.org.